"A Journey of Faith in a new place." Genre: Faith, Adventure, Humor and the human condition. 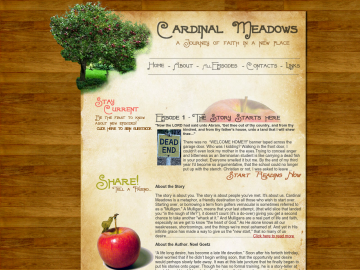 Cardinal Meadows is an Episodic Serial now passing the two year mark, with over 140 episodes having been already completed and ready to read. The story follows the life of Leonard Sommer's. Leonard's story is similar to so many twenty somethings today who finds themselves under-employed, under-funded, and after moving back into their parents homes- 'under the gun' to leave. One night, Leonard happens upon an internet advertisement for a home and apple orchard which he believes to be a sign from God. Believing that this is the answer to all his problems, Leonard sends a down payment check and drives West to the small mountain community of Cardinal Meadows. What meets him there, who meets him there, and how he endures the aches and pains of friendship, romance, adventure and faith is where this story begins. It is a story of personal and spiritual growth and seeing God's hand at work in every life and every situation. Episodes are generally released weekly and the author encourages readers to rate each new installment. Cardinal Meadows has not been tagged yet. Help others find Cardinal Meadows by tagging it! Cardinal Meadows has not been reviewed yet. Cardinal Meadows has not been recommended yet.